Beaulieu Vineyard (BV) is one of Napa Valley's most historic wineries, founded in 1900 by Georges de Latour. 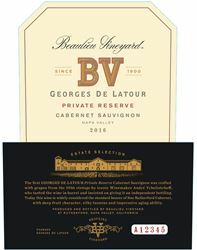 The Georges de Latour Private Reserve Cabernet Sauvignon has been the benchmark California Cabernet for decades, and BV continues to be a leader in the Carneros and Rutherford AVA's. Today, Winemaker Jeffrey Stambor continues the great tradition of finely crafted wines handed down to him by legendary BV winemaker Andre Tchelistcheff; the Maestro. BV is a rich part of the history and heritage of Napa Valley’s winemaking industry and continues to produce high-quality, award-winning wines. Our gracious and knowledgeable staff will guide you through your experience at BV whether you are a first-time visitor or a wine connoisseur. To join the wine club, visit www.bvwines.com or call 707-967-5233. * Monthly shipments of two specially selected wines from our Beaulieu Vineyard Napa Valley series and Maestro collections. * 20% member discount on all current vintage Beaulieu Vineyard wines. * Access to our Members only lounge with the ability to arrange individually tailored private tours of the winery. * Exclusive, limited edition bottlings. * Access to older vintage wines. * Quarterly hand-selected Reserve wines from our extensive library. * Winemaking and viticulture notes focused on the vintages you received. Two for one Premium tasting & 10% off your purchase. Beaulieu Vineyard is certified under the Napa Green Winery Program by the Napa County Department of Environmental Management (DEM) and the Association of Bay Area Government’s (ABAG) Green Business Program and completed all the regulatory components needed for environmental sustainability. These components included developing water and energy conservation methods, preventing pollution, and reducing solid waste. In addition to developing sustainable winery practices, this program is set to become the standard for the state of California. Beaulieu Vineyard is certified under the Napa Green Certified Land Program. Beaulieu Vineyard has created and implemented a customized farm plan with measured results that addressed all aspects of its property, vineyard land as well as non-farmed land, including practicing soil conservation, water conservation, stable drainage, riparian corridor enhancement, fisheries and wildlife habitat enhancement and long-term improvement and sustainability.